Below is a pictorial review of adaptations for fruit and seed dispersal seen in lab. Click the following link for some review material on carnivorous plants. Some definitions: A seed is a plant embryo wrapped in a protective covering. A fruit is the ripened ovary of a plant which contains one or more seeds. Most plants are rooted in place, which makes dispersing their fruits and seeds particularly important. Seeds that are spread far from the parent plant avoid competition with their relatives for resources and have the opportunity to colonize new areas. Both fruits and seeds have a variety of adaptations for different types of dispersal. Examples of the some common types of dispersal follow. <-- Left : These seeds are transported by air currents. 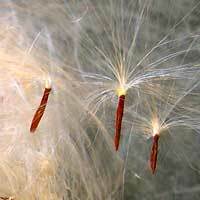 Small fruit or seeds with fine fluff can be carried high up into the air. Herbaceous plants of open areas (like dandelions, cattails, and milkweeds) often have this adaptation. Their seeds float up over neighboring plants even if the parent is growing low to the ground. 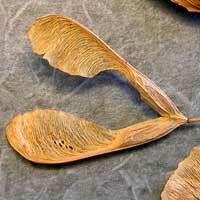 Right -->: The fruit of maple trees are also adapted to catch the wind. Many trees (like ashes and sweetgums) have winged fruits or seeds which drop from the tree and are caught by the wind as they fall. 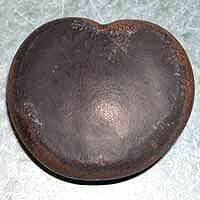 <-- Left : Sea bean seeds are adapted for dispersal by ocean currents. Sea bean vines grow along rivers and coasts. When the pods ripen, they split open and the seeds drop into the water. The beans have a thick seed coat to keep the salt-water out, and have internal structures which make them buoyant enough to float. They can drift for hundreds of miles before washing up onto land. Coconuts (which are single-seeded fruits) are also adapted for water dispersal. Like sea beans, they have a thick shell to prevent the salt-water from damaging the seed, and the buoyant hull keeps the nut floating. <-- Left : Brightly colored fruits advertise for dispersers. They are highly visible to birds, promising a nutritious (and often sugary) reward. 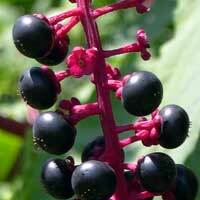 The seeds are tough and usually undamaged when eaten. They are dispersed when the bird makes a rest stop. 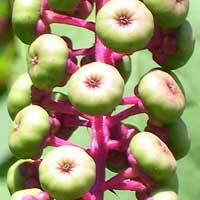 Right -->: Immature seeds in unripe fruit would die if eaten. The green of young fruit hides them among leaves. Unripe fruit are sour or bitter to discourage animals that do find them. Green fruit cling tightly to the plant, making it hard for animals to remove them. 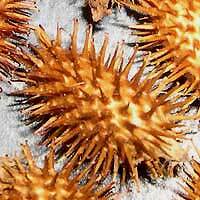 <-- Left: Cockle burrs are dry fruit adapted for animal dispersal. 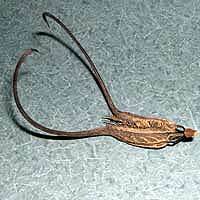 The hooked spines catch on the hair (or socks) of passing animals. Dispersal is complete when the animal picks off the offending burr, hopefully dropping it in a new location suitable for growth. Right -->: Fruit of the unicorn plant have an unusual adaptation for transport. As grazing deer or antelope walk over them, the spines catch around the animals' feet. When the animal finally gets annoyed and shakes the fruit off, dispersal is complete.